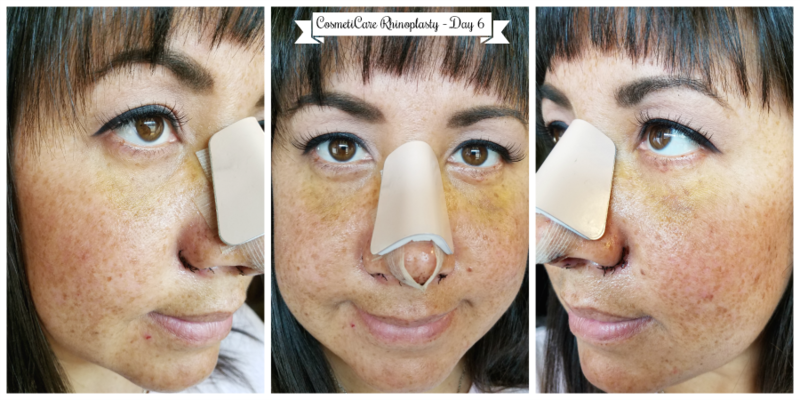 “Rhinoplasty 1st Week Transformation” – A sponsored post written by me (a CosmetiCare Ambassador) on behalf of CosmetiCare. 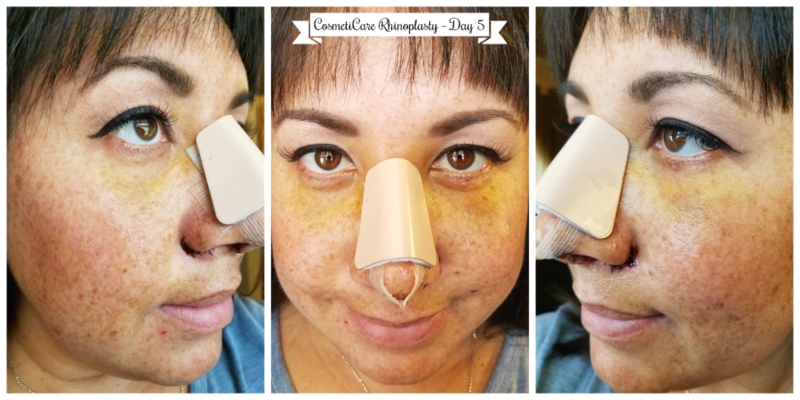 When I was considering a Rhinoplasty surgery with CosmetiCare, what worried me most was the pain and recovery. Initially when I spoke with Dr. Niccole, I joked about hibernating at home for the first few weeks, because I had expected major bruising and swelling. So much so, I was concerned that my children would be scared by my appearance when coming out of surgery and the first few days home. When considering any surgery, knowing what to expect is quite helpful in making a decision. 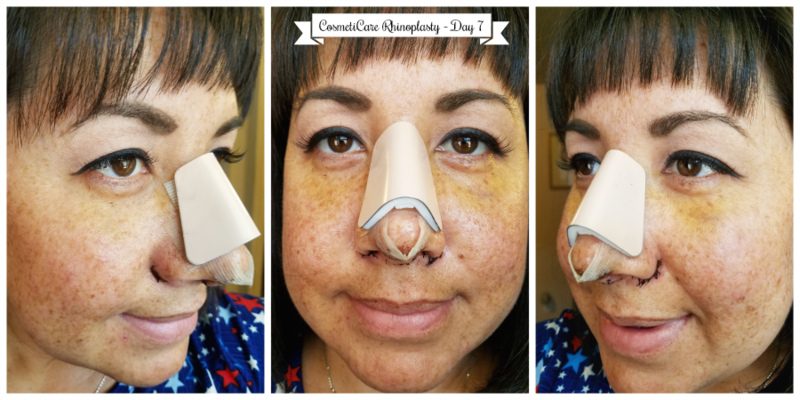 Because of this, I decided to do a daily dairy of the first seven days of recovery, sharing my personal Rhinoplasty experience. 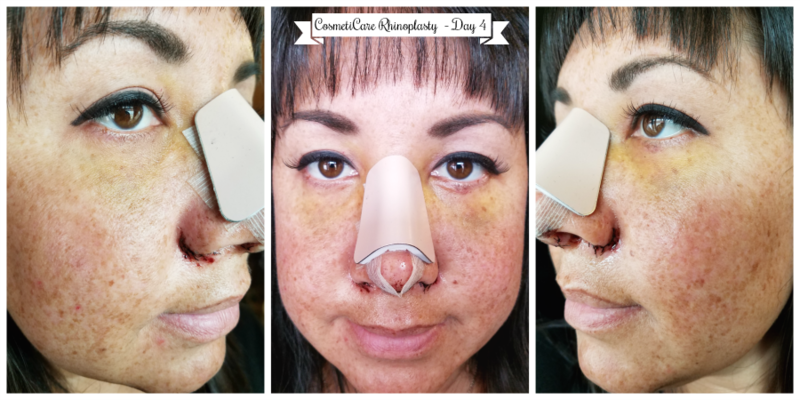 Warning: The images included in this Rhinoplasty feature are a little graphic. 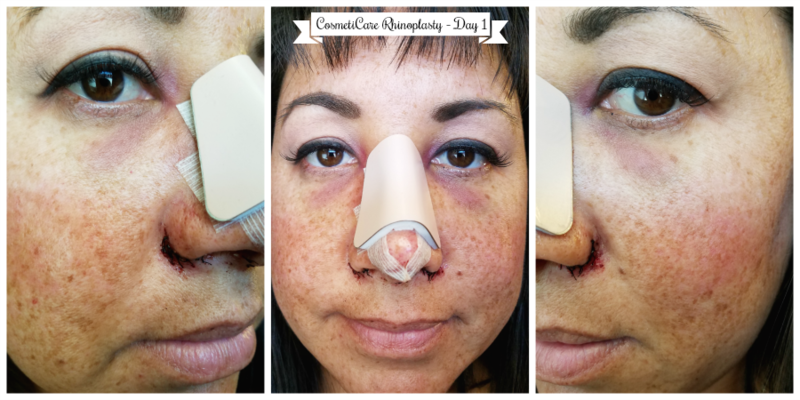 I will be sharing images of bruising and stitches, and my appearance during the first 7 days of recovery. When I woke up the first morning after surgery, I was quite surprised. I expected a lot of pain, however I didn’t have ANY! I even had a discussion with my husband about whether or not I should take my pain medication, because I really didn’t need it. However, I did recall a discussion with the anesthesiologist, who informed me that I should gradually wean myself off of the pain medication rather than an abrupt stop. Worried about additional pain when having the packing in my nose removed later that morning, I did choose to take another full dose first thing in the morning, but continued to wean myself off the rest of the day. The bruising, as you can see in the above photo was just under and around my eyes. My cheeks and under eye area were swollen as well, but also didn’t seem very bad at all. At this point, my diet consisted of soft foods like pasta, soup and lots of water. The second night, I had a rough night sleeping. I couldn’t get comfortable and was worried about a friend who had undergone emergency surgery, so I felt tired most of the day. The dark bruised areas under my eyes were just beginning to lighten and I’ve noticed a little yellowish appearance at the edge of the blue/purple area. Still no pain, and off of all pain medication. For the second day, I was craving enchiladas, which was perfect considering my soft food diet. The third night I slept better, even though I was still sleeping in a reclining position. At this point, I was a bit restless and started moving more around the house, remembering not to look down at my feet, which could cause the bleeding to resume. I was quite surprised that the bruising was already going away, and I only had a yellowish discoloration under my eyes. If I had to go out, I know this could quickly be disguised with a little bit of cover up and foundation. Up to this point I had been gently cleaning my stitches with a bit of hydrogen peroxide followed by Neosporin so they were doing well, however whenever I laughed, I felt a pull. I was so worried about pulling out a stitch so I continued to be as cautious as possible. My appetite was back, so I had a chicken salad at lunch, and wasn’t worried about how chewing would effect my nose. I noticed a little bit of a change in the swelling and didn’t ice the areas around my eyes as much. On day 4 I wasn’t feeling as well. I was a little more tired, and I noticed I was a little light headed and dizzy when I moved too fast. These symptoms lasted most of the day, so I took it easy and made sure I had regular meals. By later in the evening I realized I was hydrated from not drinking enough liquids so I immediately started downing water. The swelling was beginning to subside and make a noticeable difference. Also the bruising under my right eye was almost gone, only leaving the yellow tint, however still a dark spot under my left eye. On day 5, I noticed that most of the dark bruising has almost gone. I was still feeling pretty good, and had only a little dizziness due to dehydration. I continued drinking water, but noticed that drinks like Gatorade made me feel better faster – those electrolytes were working. I continued to see more improvement with swelling also. 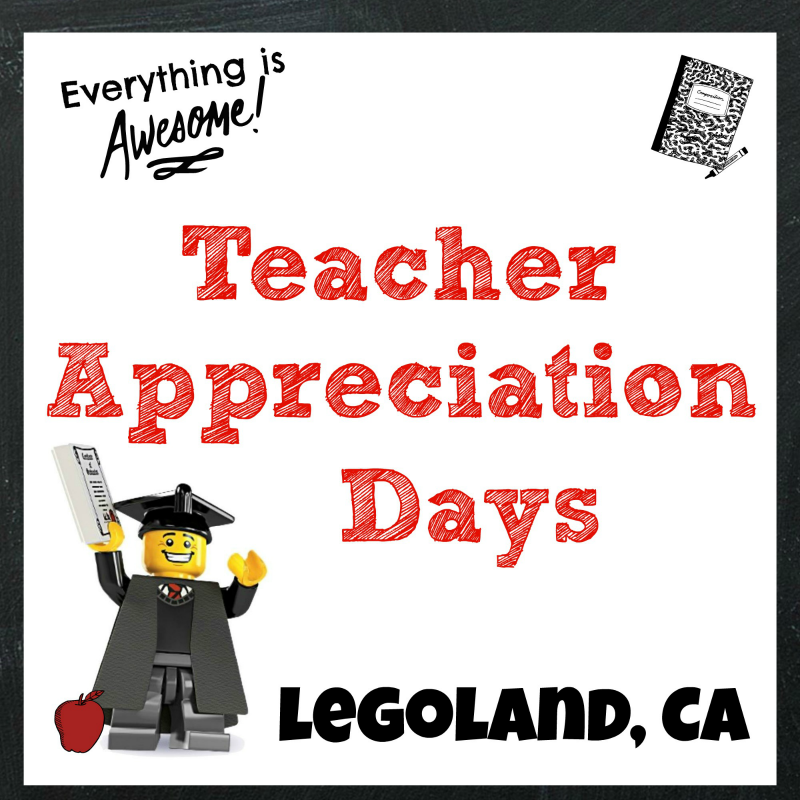 On day 6, I realized that times throughout the day I have had a stuffy nose. A couple of times I had to sneeze, which I thought was going to be bad, but in fact, wasn’t bad at all. My biggest concern was still the stitches. 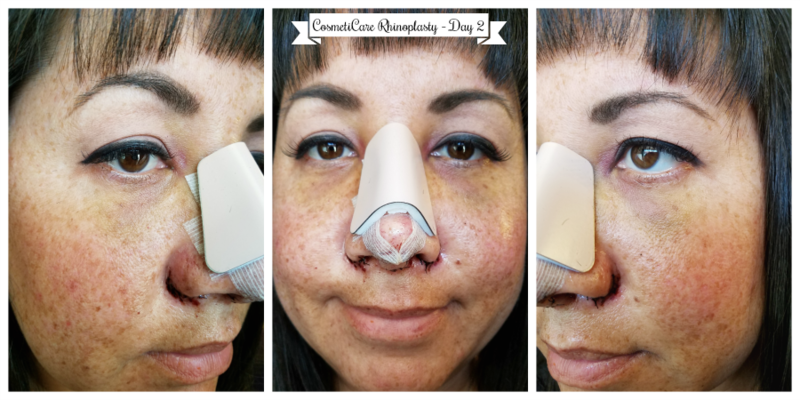 When I sneezed I realized that I automatically tried to hold my nose near the stitches so the nostrils wouldn’t expand it too much, tearing the stitches. The bruising is still a bit yellow under my eyes, but if I were to apply foundation, I’m sure I could cover it. I also noticed a little more tenderness right around the base of the cast, close to where they shaved off the bump on my nose. On Day 7, a little bit more of the feeling has come back in the tip of my nose. I am also better able to breathe. Swelling was looking better and ready to get the cast and stitches out! Everything up until this point had been great! Very pleased with the recovery process so far. 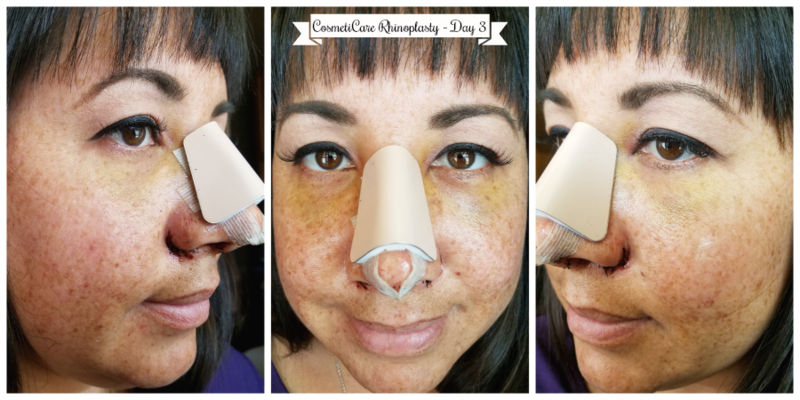 Thinking about getting a Rhinoplasty yourself? 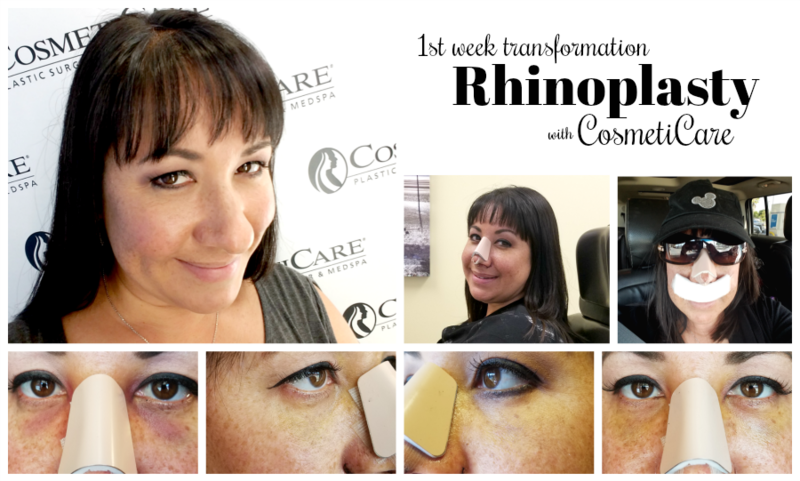 Contact my friends at CosmetiCare and tell them about my personal discount code: JEN100 and receive a free consultation plus 10% off a Rhinoplasty procedure. 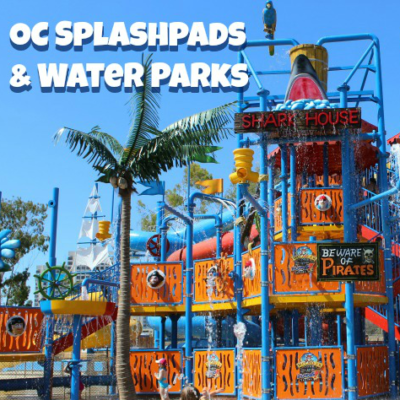 Just share the code when you book an appointment online or via phone at 949-438-5578. Stay tuned for the next steps….